Orectolobiformes, also known as carpet sharks, are a diverse of sharks characterized for having two dorsal fins, five gill slits, and relatively short mouths. Several species have barbels and some have intricate carpet-like patterns, which give this order its nickname. Orectolobiformes range in size from just over 30 cm, like some species of @carpet shark, to the whale shark, the largest fish in the ocean, which can be up to 14 m long. 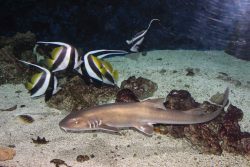 Arabian carpetsharks can be found in the western Indian Ocean at depths between 2 to 100 m. They inhabit coastal waters with coral reefs, lagoons, rocky shores, muddy bottom and mangrove estuaries. Biology and Behaviour Arabian carpetsharks have their… read more. The Banded Wobbegong shark is a common bottom-dwelling carpet shark of usually found in clear water reef associated areas. This species is native to the Eastern Indian Ocean off of Western Australia. 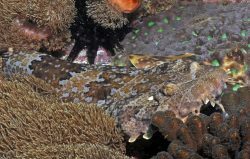 Biology and Behaviour: The Banded wobbegong shark… read more. The Barbel-Throat carpetshark is a rare species of carpetshark found in the South China Sea, between China and the Philippines. They are reportedly found at depths of between 183m and 190m. They grow to a maximum length of 33.5cm and… read more. 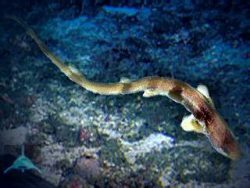 The Brachaelurus Waddi, also known as the Blind Shark, is one of the two species of Carpet sharks in the family Brachaeluridae, along with the Bluegrey Carpetshark. Biology: This shark has a stocky body and a wide flattened head with… read more. The Brachaelurus Colclough’s shark, also known as the Colcloughs Shark or Bluegrey Carpetshark, is a species presently known from only 50 records, mainly found in the east coast of Australia. This species belongs to the Brachaelurus family. Biology: This species… read more. Brownbanded bamboo sharks can also be called Grey Carpet Sharks. They can be found in the Indo-West Pacific from Japan to northern Australia at 85 m underwater around coral reefs and tide pools. Biology and Behaviour Brownbanded bamboo sharks can… read more. Intro: The Burmese bamboo shark is bottom dwelling tropical shark that is native to the Eastern Indian Ocean, off Rangoon and Burma. This species is part of the Carpet and bamboo shark family. Biology: The Burmese bamboo shark has… read more. 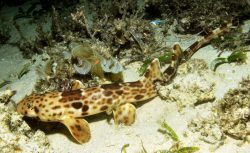 The Cenderawasih epaulette shark is a newly-discovered species of bamboo shark found the Western Central Atlantic. Their name comes from the Cenderawaish Bay, Indonesia, the site where they were discovered. It lives in shallow waters of up to 4 meters and… read more. Do you have images or videos of Carpet Sharks – Orectolobiformes?